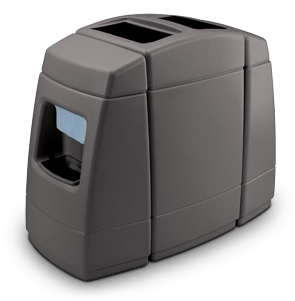 The Haven series windshield washing stations feature a double sided waste container with a side pod service center. Haven 2 comes with two windshield washing pods and Haven 1 has a single pod. Easy to clean with a standard degreaser. 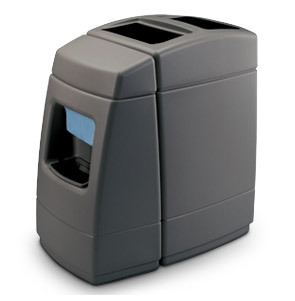 Side pods secure to waste receptacle with included hardware. Haven Side Pod Windshield Washing Station. Lift-off lid for easy trash removal includes patented Grab Bag™ System secures trash bag in place. Molded from long-lasting 1/8" thick 25% post consumer recycled polyethylene plastic and won't rust, dent or chip. Each side pod holds a standard size towel dispenser which accommodates 1 or 2-ply folded paper towels, the suggested towel size is 10" x 10". The removable water buckets holds 2 gallons of water. One squeegee included per pod.